I posted this in the wrong spot...it's supposed to be here in the 'Latin Translation' thread. My apologies! The word is paterfamilias (or paterfamiliae)—both mean the same thing—head of household/patriarch. He is the senior member of his (extended) family. So Simon was the patriarch, but unfortunately, looks like I can't make any conclusions about his specific relationship to the bride and groom. 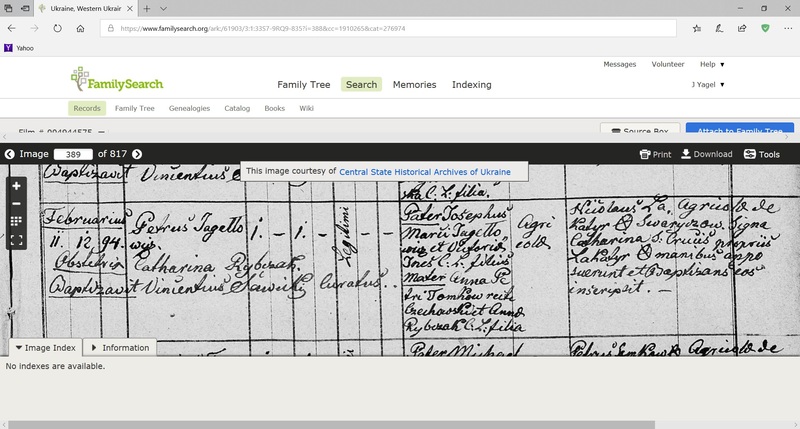 One more excerpt from the same marriage registers from Borowa parish in Galicia, Austria. I need a bit of help with the first column and the last column. I'm a little confused on the groom information and the information which follows the names of the witnesses. The abbreviations in Col. 1 are titles of nobility. They are both the same title in the masculine and feminine forms—Magnificus Dominus and Magnifica Domina. The Polish for Magnificus Dominus is Wielmożny Pan and was used for members of the szlachta who were court officials. The English would be Esquire (Esq.) The col. translates as Wielmożny Pan Stanisław, the son of Jan Olszewski and of Wielmożna Pani Agnieszka née Krobecka. The next part of the entry is a bit unclear in my mind as to whether Szymon Skopinski is named because he also was an official witness or whether he is named as a continuation of those granting permission/consent for the marriage. The entry is in Polish and translates as “Szymon Skopinski, the father of (his) underage daughter, Agnieszka. Usually in the case of a 17 year old bride the consent of her father would be entered in the form of a sentence which would read something like: “I, Szymon Skopinski, grant my permission to my underage daughter, Agnieszka, to enter into the bonds of marriage with Stanisław...etc. It is clear to me that the entry indicates that Szymon has given his consent. It is not clear to me that he was also considered one of the official witnesses. That is a judgment call you can make. According to the rules of the R. C. Church, for a marriage to be considered valid the consent had to be given in the presence of three witnesses, the priest and two other competent individuals. Of course, more than 2 additional individuals could also witness the consent. In the 19th Century the custom was that the two official witnesses be male. These days the 2 official witnesses are referred to as the best man and the maid/matron of honor. P.S. The maiden name of the mother of the bride is entered as Drozdowska. Could you assist me in translating the attached marriage record. The record itself is in Latin but it also contains two statement in Polish. The first is the statement of the bride and the groom and is followed by their signatures. The second is the statement of the witnesses and is followed by their signatures. The Latin text is one long sentence and mostly specifies that all the requirements of ecclesiastical law had been fulfilled, which results in a rather stilted run on English sentence. (It is OK in Latin but would merit a poor grade from an English teacher.) In the Latin text I cannot verify the geography. Here is the translation of the Latin text and a summary of the two statements. Latin text: On the 7th day of the month of February in the Year of Our Lord 1827 I, Adam Labanowski, vicar of the parish church of Mosediv(? ), after, according to custom, having examined them beforehand, and after having received their mutual consent, and after the three banns had been proclaimed beforehand in the parish church, and since no Canonical impediment had been discovered, joined in marriage Antoni/Anthony Giedwillo from Polypkalnie, parishioner of Ptotel??? and Barbara Kayrewiczowna from the village of Girszyny(? ), a parishioner of Mosediv(?) and blessed them in the church of Mosediv(?). Next follows the statement of the bride and the groom in Polish. To summarize the statement...They state that they enter into the Sacrament of Matrimony for all the right reasons and of their own free and good will. In testimony of the truth of the above statement they affix their signatures. The signatures of the groom and of the bride follow. Next follows the statement of the three witnesses in which they affirm that they are aware that Antoni & Barbara entered into the marriage without coercion and of their own good will. They testify to the truth of the statement by affixing their signatures. The signatures of the three witnesses follow. Thank you very much. These puzzle never seem to be easy to solve - and I really appreciate your assistance in my journey. I was hoping for a reference to a parent or at least an age (I guess at this point in time they still weren't including that information), but your interpretation of his parish was very helpful. Now that you mention that name I think the second letter is probably a ł as there is a village Płotel not far from Mosedis. In case you're ever curious I've found this website (http://www.fallingrain.com/world/LH/a/) to be very helpful for finding SOME of these places in Lithuania. Thanks again for you assistance! 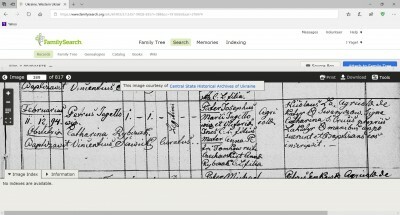 I am posting an image of an 1860 Roman-Catholic/Latin Birth record of a Petrus/Piotr Jagellowicz (in house number 94). It is today in Ukraine, south of Lviv. My question is about the mother/mater section of the record, and the word "reike?" used in it. What does this mean? Here is how I read it: Mother's name is Anna Tomkow. Anna is the daughter of Petri/Piotr Tomkow "reiki" Czechowski and Anna Rybczak(?) C.L. filia. What I do not userstand is the "Tomkow reiki Czechowski" meaning. If someone can explain, thank you in advance. As sometimes was the case during the 19th Century, surnames could still be fluid. Evidently he was commonly known as Tomkow, although his proper surname was Czechowski. Hope this clarifies the text for you. 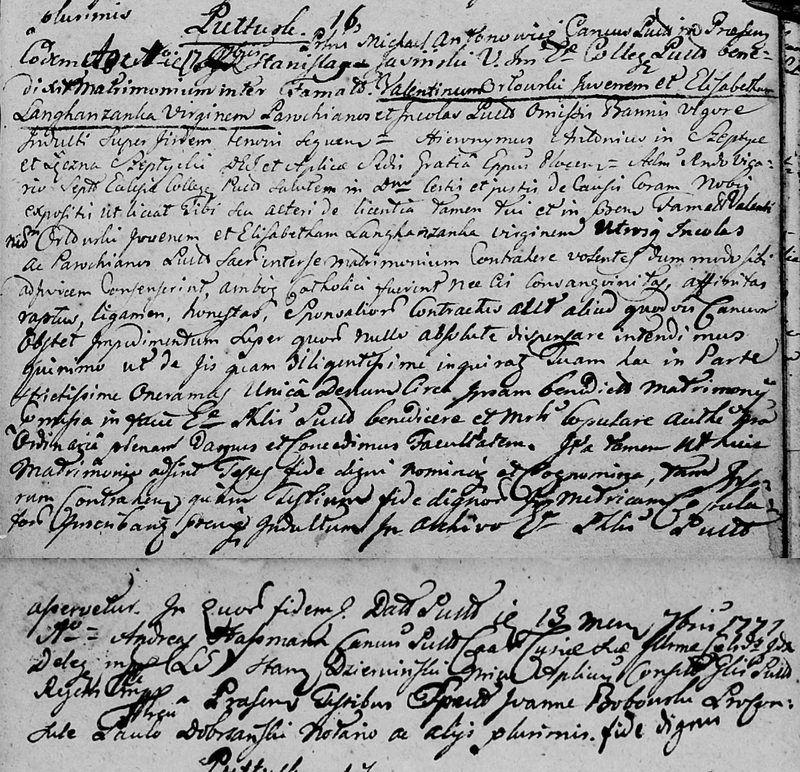 Can you assist me with translating this varniai parish death record (I think I know the names/dates, but would like to understand any other details in the file)? 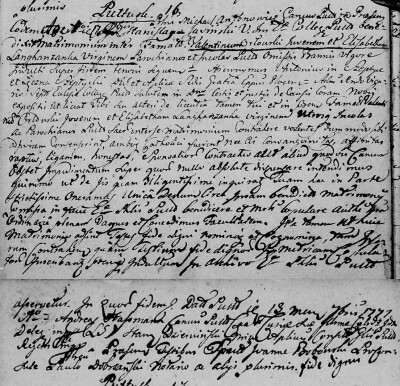 Can someone help to translate this marriage record from Latin to English. Thanks! The second thing I found interesting was the choice of vocabulary used to describe Katarzyna/Catherine. She was described as a “Geometrissa”—a surveyor’s wife—a new word even after playing around with the Lingua Latina for sixty years as a student and a teacher and then a hobbyist. It is always fun to see something new. The Latin for a surveyor is “geometria”. I believe that geometrissa was formed in the same way that cmethonissa (a self-sustaining farm wife) was formed from cmetho (a self-sustaining farmer). Anyway, so much for the tiny bits of new info life brings. 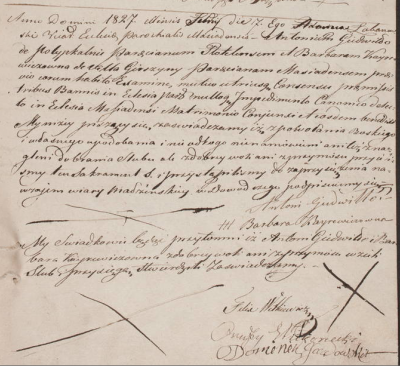 Polipkalnie: On the 4th day of the month of May in the Year of Our Lord 1803 the well-born* Lady (Polish: Pani) Katarzyna/Catherine Giedwiłłowa**, 45 years of age, the wife of the surveyor of the Duchy of Samogitia (Lithuaninan: Žemaitija; Polish: Żmudź) of the territory/area of Polipkalnie died after having been fortified with all the Sacraments, and was buried in the parish cemetery of Varniai. Notes: *GD = Generosa Domina = Well-born Lady (Polish: Pani): Owner of at least one village. **The suffix -owa denotes a married woman, in this instance: the wife of Giedwiłło. Please provide some geographical information for the request you posted. Names of the villages and the parish from which the record came make reading the document easier. 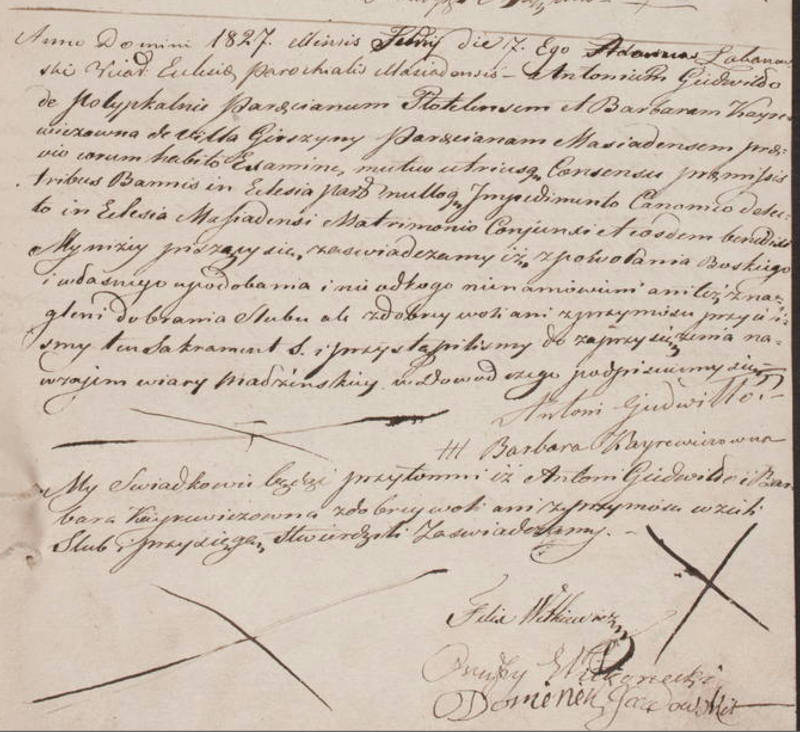 This document is from Pułtusk. The name of the couple are Walenty Orłowski	and Elżbieta Lange(??). Thanks Dave for the translation assistance! I'm glad to hear that you found something new and interesting in the death record (it's all interesting to me as it relates to my ancestors, but I always worry that it's probably tedious to you and the team). I was wondering if the statement was going to tell me that her husband was the Director of Surveying or something (I wasn't sure what Ducatus meant). But the usage of term "Duchy of Samogitia" is pretty neat too. Thanks again - very helpful.